High 99.6% B.F.E. 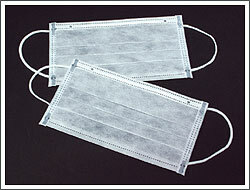 at 2.8 micron and low breathing resistance ( P) 1.2 mm- for protection against airborne particles and splatters of blood and saliva. 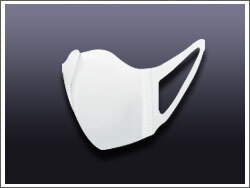 Special 3 dimensional design which could provide better facial seal than the traditional rectangular mask. Specially selected materials which are soft lining, fluid repelling, non-irritating and fiberglass free. Suitable for oral, dental procedures and other surgery/operation. 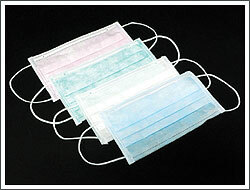 Fiberglass free, odorless, low breathing resistance and non-irritating to the skin. BFE (Bacteria Filtration Efficiency) up to 99.9% at 3.6µm particle size. High 99.9% B.F.E. at 3.3 micron and low breathing resistance ( P) 2.53 mm- for protection against airborne particles and splatters of blood and saliva. 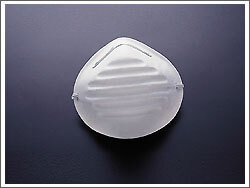 Encapsulated nosepiece avoids the reflection of strong light during surgery and provides an excellent custom fit. High 99.9% B.F.E. at 3.3 micron and low breathing resistance ( P) 3.13 mm- for protection against airborne particles and splatters of blood and saliva. Special 4-ply pleated design with high performance active carbon pre-filter against nuisance organic vapors. Used for the removal of a wide variety of contaminants, bad odor and organic vapors below the OEL. © 2004 SAN HUEI UNITED CO., LTD. All rights reserved.